Wow. This is awesome. The confession itself and then the story told in the style of the writing. Fantastic. Thank you. It felt like a puzzle to write-hard but rewarding. All of your work was worth it. It’s a fantastic read! Ha. Too much. I disagree, I think there was JUST enough. I liked the naughty ones too! So much more interesting. I love hearing success stories especially triumph of the underdog style. Some so called naughty kids are just misunderstood. Every behavior has a root cause. Everyone tries to be so perfect nowadays In an attempt to fit in. If we’d only realize that the more perfect we seem the more isolated we become. You invited us into your universe in such a real way, I love the way you wrote this. Your writing style is really vivid – I had such clear images of everything. Well done! The structure and title let us know that this is really two stories: about trying to write how you feel about your son and then the actual story about how you feel. Nicely done. Confession – I rolled my eyes when I read the title and thought, “Not another woman complaining about how she has no time to write because she has a kid and not another person writing about writing.” Thank you for shattering my expectations. This is so good! I love the story-within-a-story feel – it perfectly captures the image of just trying to sit down for five minutes. Wow. Thanks. And then there are days Ike today when I’m so exhausted the thought of doing anything more than just the bare minimum I have to spend it mostly in quiet contemplation. life is truly a roller coaster. I think most moms feel inadequate and not-so-good at one point or the other in parenting life-time. But it is okay to feel so. I loved your story within story style of writing. Thanks! I feel that inadequate thing way too often. I wish there was a vaccine. Thanks for stopping by. Oh Lisa, you have no idea how this resonated with me and you are not alone! While my son was not diagnosed with ODD (but it was on the table for a short while), his ASD tendencies when sometimes compared to other kids makes me feel the same way. You have no idea how much your comment means to me, Diana. Most days I’m pretty convinced that I’m the only one struggling with this. Hugs to you old friend. Love the way you tell this, especially with all the mini-dialogues at the end. The ending, too, warmed my heart so much! Awesome! Thanks for being transparent, Im not a mom but I was able to follow your post and understand. Thanks. I’m glad you did. It’s also about what it’s like to write while constantly being interrupted. We can ALL identify with that, huh? OMG. Puppies and babies are SO similar. We got a puppy about 7 months ago, and it it was hell. Cute, but hell! This is amazing! I just started my own blog and have no idea what I am doing. I just made my first post and then stumbled upon yours. Really remarkable- everything about it. Awesome. Best of luck. 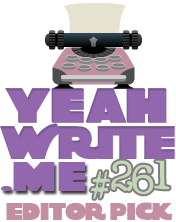 Join us at yeahwrite.me for some fun writing!! I will do that! Thanks so much!! Then, vote if you want. (You have to read all entries in any category you vote for. The computer sees all.) Have fun! So appreciate the honesty of this. If it helps, I can relate in my own way, and I think many can, but just wouldn’t dare to express it. Fantastic play in conveying the story, too. Thank you! Thanks for appreciating my honesty. It was not an easy one to write, but it felt like I HAD to say it, you know? This post is beyond awesome. I love how it was in real-time. I’m a father and I can relate. My oldest son is defiant, and right now I’m chalking it up to him being at that age where he wants to see how far he can push things and what he can get away with. He really does like helping out around the house and whatnot, but he also likes to say “no” and likes to do things “when he feels like it” and being the father, and the first/most important male figure in his life, I have to let him know what’s tolerated and what’s not. He gets away with waaaaaaay more with his mother than he does with me, but I hear it every day. I’m doing my best to keep my eye on him and see if it’s a more serious thing, or if it’s a phase that he’s going through because he’s 8 and easily influenced by kids in his school/class that lie and talk about how free and cool they are at home and how they have $1,000,000 worth of toys and he doesn’t. You had me at “beyond awesome.” Parenting any kid is difficult, but parenting one with ODD, well, that might just kill me. Keep up the good work and thanks for stopping by. I loved your article, but I quickly thought of the neighbor kiddo, and his mother – I’m sure they have their moments and days where they struggle, and the mom is pulling her hair out. Having worked with kiddos with an ODD diagnosis, and their mothers, I know your frustrations are real, and constant. Hang in there!! And, perhaps because of your struggles, you are better able to appreciate the silver lining when there is a sweet moment (like the ending of your post). Just a thought! Love the fact tat you are open and honest about your feelings, first time hearing of this disorder but i am sure it can be difficult at times to deal with, without losing patience(just out of frustration, not that yo don’t love your boy unconditionally)Very good and candid piece. Thanks Mrs. Dee. I LOVE tea and this comment too. I absolutely love it… This is going to cause me to be more transparent in my writing. Love this. You captured for me, the whole real people livin’ life vibe which is what I connect to the most and also enjoy reading the most. I am still finding my voice here but reading blog posts like yours continues to build my confidence; claarly, there are real people writing and that I too, can muse. A thousand thanks. Yes. Transparency feels dangerous but also freeing. Thanks for the kind words. Publish because I haven’t found too many blogs that just say it, if you will. I told my husband tonight that I should delete my most recent post and stop writing (I’m highly emotional and often irrational). Cheetos fixed that. Hee hee your son sounds funny!! Well…. Okay, fine. Max does have his good qualities. He does, but that doesn’t make for very good story-telling. Lol! And you are SO right, “So. Much. No.” Indeed. Makes me want to scream … alot. What a delightful read! I am so glad I read this post. You write so well. Very well written, definitely feels like you were inside my head writing down everything I’ve thought. Except…well, my son doesn’t have any neighbors to play with and even if he did, he probably wouldn’t want to. He has “O.D.D.” as well, inside autism. Good times. *hug* Thank you for being REAL! Good luck with the neighbors lol!!! I absolutely love this! From start to finish. The story, the delivery, the message. I have my own parenting issues these days and my suggestion to everyone is don’t have teenagers… I’ll take terrible 2’s again just to avoid this next phase of life! God help me when this child gets to be a teenager. There will not be enough chocolate and Xanax in the universe …. Thanks for your support and comment! Wow, love your writing. It’s so raw and honest. As a fellow non-fiction writer, I appreciate real-ness and honesty in writing more than anything. There’s a certain raw beauty that can be captured in non-fic that can’t be found anywhere else. I’ve just been getting started writing non-fic here myself, and hopefully I’ll be able to capture the honesty of life just HALF as well as you have. Thank you for sharing! I was diagnosed with ODD as a kid (it may have been a misdiagnosis though, since it turns out I am autistic) and every third word I said at his age was probably “No!” It’s like when you’re poked and you say ‘ow’ even if it didn’t hurt but it *could* have, your brain is filling in a gap. Except unlike the ‘ow’ which lacks pain, the urge to say no comes with the very real emotions of not wanting to do something. Don’t worry if you’re not always the most understanding at all times, just try, if you’re trying he’ll forgive you. Trust me. This comment is so insightful. So few people have ever heard of ODD much less been diagnosed with it. Thanks for your perspective. Hi..i loved the way you’ve expressed what you have felt as a mother. And trust me what we feel is something just that nobody else can understand. I like the transparency in your writing. Keep going. Thank you SO much. I’m so glad I’m not alone. Your POV captured the struggles you face in a ”simple’ afternoon playdate.Until now I was unaware of Oppositional Defiance Disorder – certainly will realign my thoughts when faced with similar situations in the future. Thank you for this educational post. Brava! My daughter isn’t really a problem child. Yes she throws her fits and there are kids out there who listen way better than she does. What drives me insane is that I don’t know what to do with that. She doesn’t like baths, but only cause she doesn’t like water in her ears. She won’t eat most sweets. All she eats is veggies and fruits. I don’t know how to feed a child who only eats vegetables and fruits when I love meat. She says please and thank you, though not all the time. She knows her abcs and 123s. She has an amazing memory. I hate it when people tell me how perfect she is and tries to get me to do things. Put her in modeling. Be happy that she doesn’t like sweets and is easy to calm down when she is upset. She doesn’t throw a fit when it is time to go. Takes her medicine. Goes to bed like she is suppose to and will sometimes tell me she needs to lay down way before bedtime. Having what people view as a ‘near perfect’ child isn’t easy. Sometimes I wish she would throw a few more fits. Tell someone to shut up. Punch someone. My parenting classes did not prepare me for this. Trade ya? Just kidding. I think you could write a really good piece on what it’s like to be on your side of the story. Thanks for stopping by! It’s amazing how you right and get it picturing and identifying ourselves in each character.. Being loved by teachers makes you hated by friends but that isolation you might get use to it..
Incidentally, I was Alex many decades ago. I am sure many parents hated my guts as did many kids, whose parents started any conversation with them with “look at LG, why can’t you be like her”. Oh well, it takes all sorts to make the world,no? This was amazing!! The interruptions spoke to me on a very personal level, haha. I have a 16 month old. Aw. Thanks. Yeah. I really set out to write what it felt like to never be able to finish a thought, but then it turned into a whole other thing. You told your story beautifully. Your descriptions were spot on. And, breaking your paragraphs with conversations here and there is genius! 👏 You perfectly depicted how it is to live with a kid! Congrats to you for sharing. Its so challenging to raise a child who is out of the box. My son is my sunshine but I struggle SO much with trying to understand what is happening within him. This parenting thing is the hardest job experience in the world but everyday is a new day to begin anew. Wow! Where were you when I was just becoming a mom? Thank you for the “real” in your post. I can not only relate, I have to laugh, because you just remind me of the me after my first two. I figured if I didn’t break the first two, I had a pretty good chance the following ones would be fine and probably wouldn’t end up on the Dr. Phil show one day. Great post! Aw. Thanks. It’s funny how sharing your truth liberates other to share too. I guess we’re all just doing the best we can.